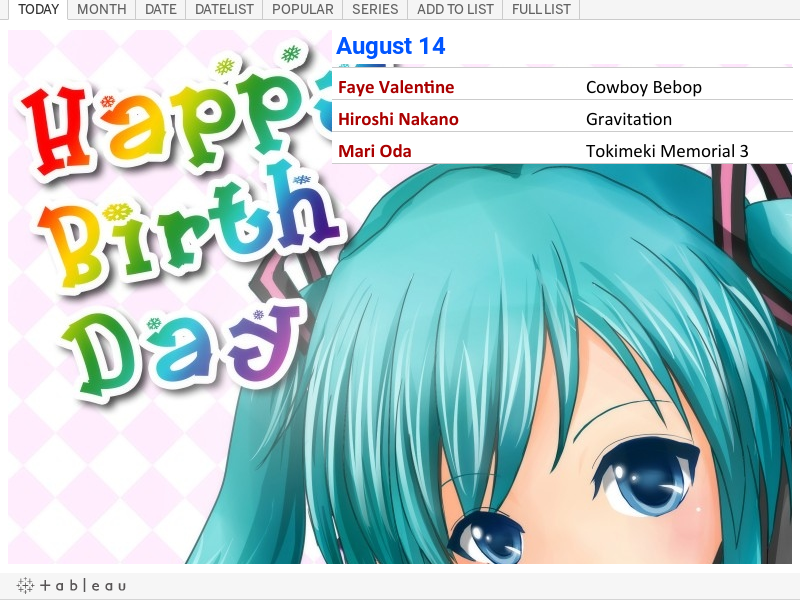 You came here for birthdays, so the ideal greeting is a list of which character's birthday it is today. I think the date mechanism is synced to the time on your browser so that someone across the date line gets a different screen than you if both of you were accessing it at the same time. 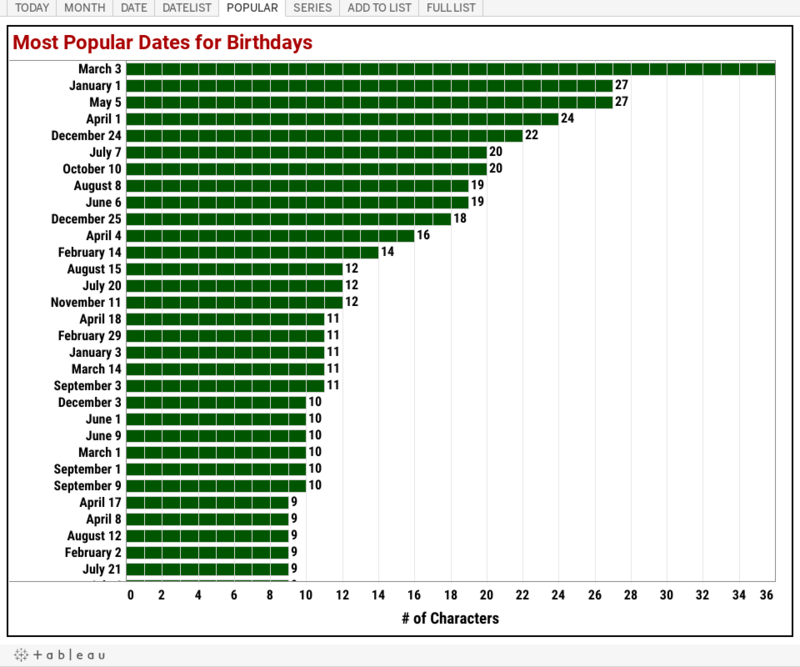 Next, have a look at the distribution of birthdays by months. 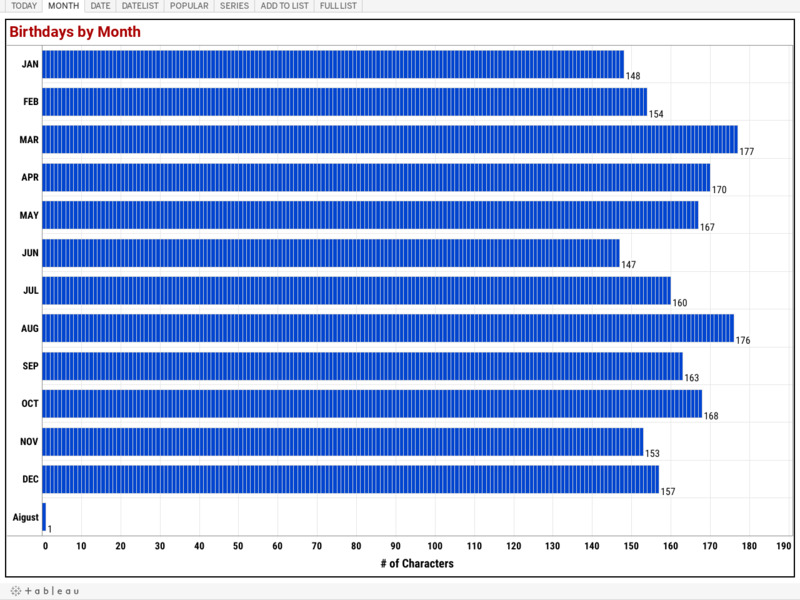 You can get to the screen above by clicking on the MONTH tab of the viz. After the first time, you can use this as a long term preview. I'm impressed with how evenly distributed it is for something that is an artificial construct. I would not have thought of a bunch of random people choosing birthdays for their characters would have been so evenly spread over the months. People definitely have favourite days, which translates into skewing of monthly distributions. While some months are favoured more than others here, it is not to any significant extent. You can move our mouse cursor over the little bars and see the pop-up of characters listed from early in the month at the top, then alphabetically within each date starting with A at the top. How's that for organization? You might be out of luck if you have a touch screen as I'm not sure how you "mouse over" with a touch screen. Maybe tap on some place. It greys out everything else but you get a response. I know the bars are miniscule but no worries, this is a big picture preview. Other dashboard lets you pinpoint exactly what you want. Click on the DATE tab will get you to the screen above. Here, you can scroll through the days of the year from start to end and see not only how many characters have birthdays on a given day, but who and how they space out relative to each other. You'll have to mouse over the blocks to see the pop up of which characters are represented, or click on it if you're using a touch screen. Or go to the next tab and pick one day at a time to get the list for the day. As you can see, there are definitely some days that seems to be favourites. Why, though, I have no idea. March 3rd is the most popular by a gap, for example. I'll fix the totals at the top of each bar that got cut off soon. I don't know anything historically super important that stands out right away as being on March 3rd, though quite likely because it might be a date especially important to the Japanese who created a lot of these characters. January 1st and Christmas Eve and Day were also popular, not surprisingly. There are 5 dates without a character's birthday associated with them and it's my goal to get rid of that one day soon. It's no fun if your birthday is on one of those dates and you go to check only to find out no character on my list of almost 1900 shares it with you. 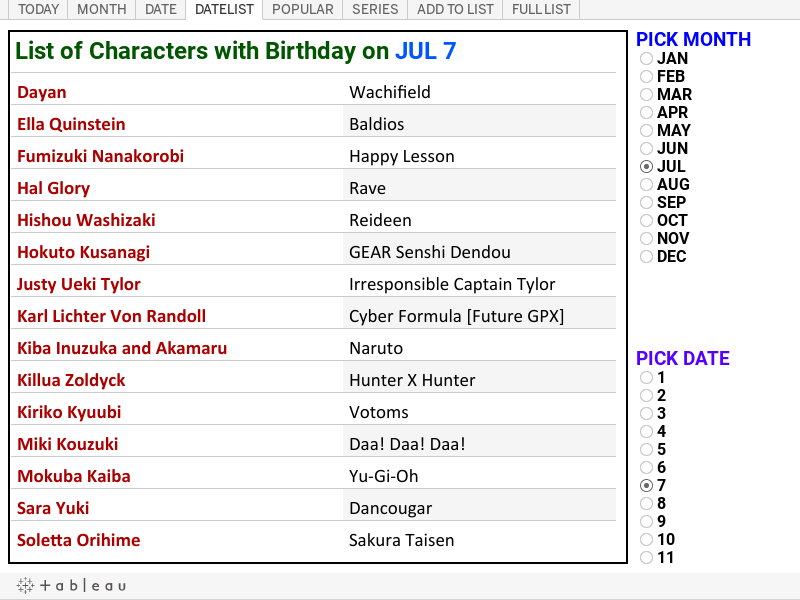 If you know of a character with a birthday there, please leave a comment and I'll update my data. Before you do more analysis like that, though, I created another tab like that I'll get to in a few moments. Use this for a quick daily overview. 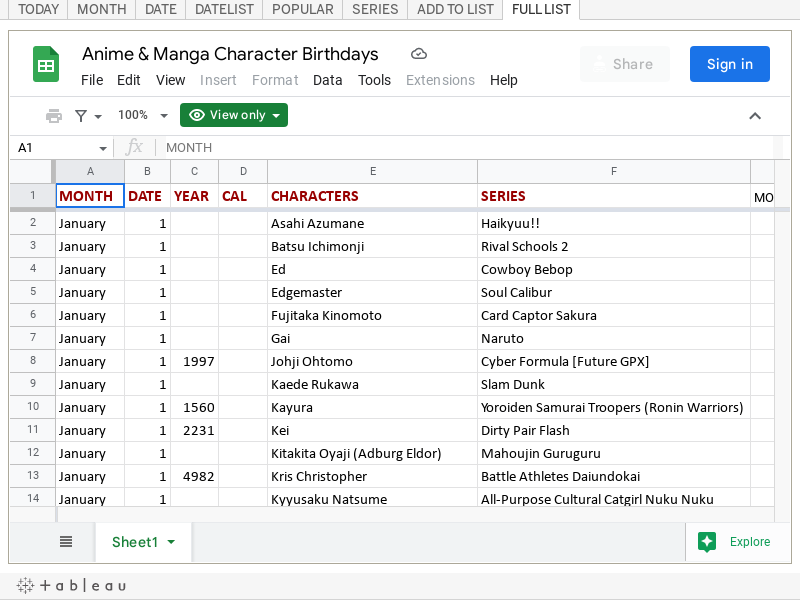 Unlike the DATE tab, the DATELIST tab gives you a written out list of a who has birthdays on a particular day of your choosing, at the right. This is one of the few dashboards that gives you text information rather than visual graphic information. 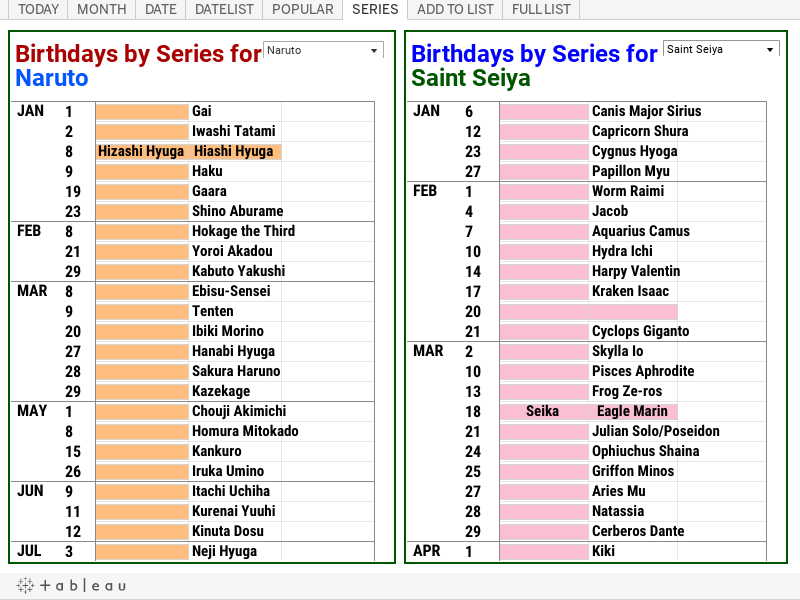 This is where you'd go to see most and least popular dates for birthdays of anime and manga characters, along with how any other date compares to one another. Make your own theories as to why some days are more popular than others. The SERIES board shows a distribution of characters' birthdays from a series in order throughout a year. This is kind of fun to see, like birthdays of a group of friends, or people in the same "circle"... even if some are mortal enemies. Since most days only have one person, what I might do is in the next update, get Tableau to list the name of the character so you don't have to hover over the bar to see. You'll just do that to get the series, date and so on. You're looking at the first draft right now so there'll be more changes coming. Please feel free to suggest ideas. I may not take them, but I'm willing to at least listen to them to consider them! I created this chart to help you, help me, make this list and tool better! All the series are listed at the bottom, and you'll have to hit the scroll bar upon first viewing to get to the base of the graph. I'm not sure why this is happening right now but I'll try to fix that. First, if you notice a series is not there in alphabetical order, there's something you can help with. Identify it and at least a few characters in it, with birthdays. More likely, look at the series and the number of birthdays associated with it, listed at the top of the bar. Does that number sound like the number of at least semi-important characters in it who might have a birthday listed somewhere? If not, as it my total is less than your guess, mouse over the bars, or go back to the SERIES tab, to see who I've got. For example, Black Butler must surely have more characters than Ciel Phantomhive! I'm not knowledgeable about anime but I can't imagine Ciel being the only character from Black Butler! From your knowledge, you'll probably be able to identify some missing characters from my list. If you were willing, you can them find out their birthdays (or just recall) and share them in the comments. I'll acknowledge every comment I add so you know it'll have been taken care of. Thanks to my friend Tiffney who provided 35 characters recently, mostly Code Geass, Sword Art Online and Ao no Exorcist! She put the list over 1900. I'm aiming for 2018 by 2018 so please do help if you feel like it! She also provided layout feedback that was very helpful to make these boards easier to read. Thank you! 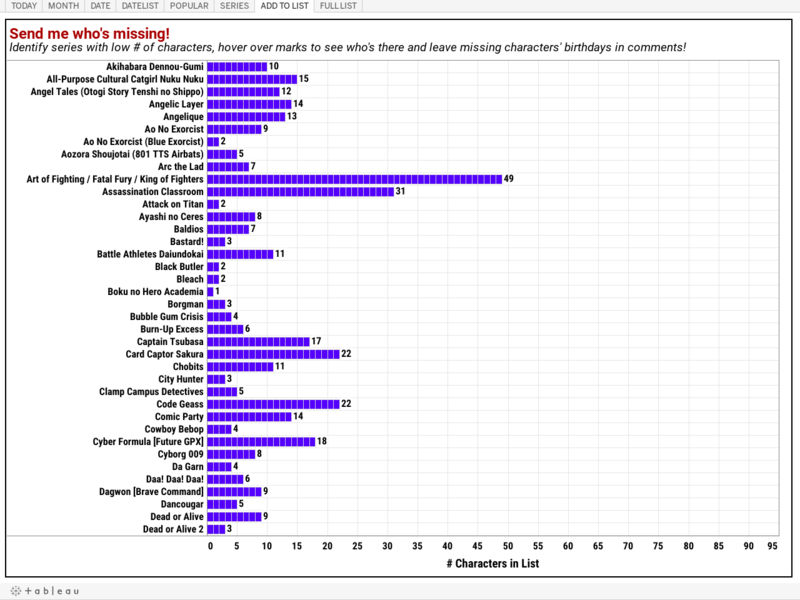 You can see the full list of characters supporting this database, in table format, here. Thank you!  Asami Ryūichi from the Finder series has been added. It won't show up until the overnight refresh, though, but it'll be there from now on and on the front page next year. Happy birthday, Asami!